Robert O'Meally, Professor of English at Columbia University, discusses Duke Ellington. Duke Ellington was a composer, musician, and bandleader who changed the sound of American music and took its new sound around the world. 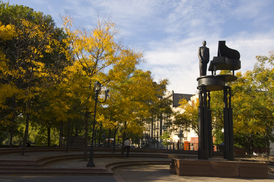 The Duke Ellington Memorial towers 25 feet over Duke Ellington Circle. 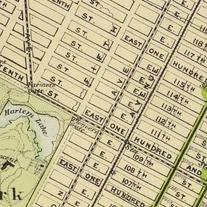 It is located at the northeast corner of Central Park at 110th Street and 5th Avenue. Edward Kennedy Ellington (1899–1974), known as Duke Ellington, changed the sound of popular music in America and around the world. He began by playing the piano at age 7. In 1917 he formed his first band, called The Duke’s Serenaders. They played in their hometown of Washington D. C. until Ellington left the comforts of home for the creative energy and opportunity of Harlem. Once there, Ellington’s band played frequent gigs at the famous Cotton Club. It was a whites only club, but fans could tune in to hear live broadcasts of the shows. The Duke became famous and his band played on throughout the Great Depression. Duke Ellington died in New York in 1974. On the day of the funeral a black man, who had come down from Harlem, said, "I'm just here to bear witness. A man passed through and he was a giant." 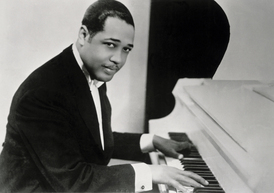 Kellie Jones, Columbia University Professor of Art History and Archeology, discusses renowned composer, musician, and bandleader, Duke Ellington. This portrait of Duke Ellington comes from the Alexander Gumby Collection in Columbia University's Rare Book and Manuscript Library.